LAGOS – President Muhammadu Buhari and his wife, Aisha, voted in Daura, Katsina state in the Presidential and National Assembly elections. 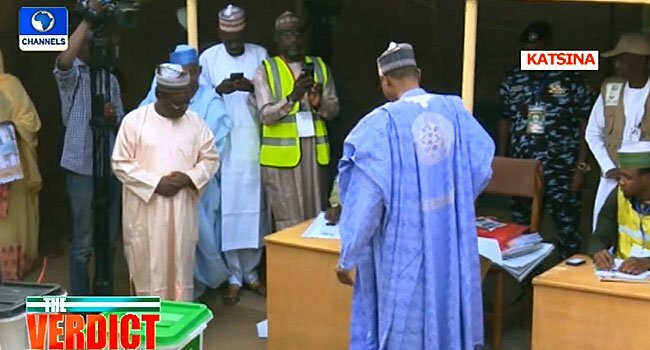 The wife, Aisha, voted before the president at 8.06 a.m. local time according to Legit.ng a local daily, while the president voted at 8.10 a.m. at the Kofar Baru, Sarkin Yara “A” ward in Daura. He left the polling center immediately after casting his vote. Meanwhile, dynamite explosions have rocked parts of Port Harcourt As residents of Port Harcourt, Rivers state prepares to vote, dynamite explosions have been heard in several parts of the state capital, Legit.ng a local daily report.